“See, my servant shall prosper, he shall be raised high and greatly exalted. Even as many were amazed at him— so marred were his features, beyond that of mortals his appearance, beyond that of human beings. He had no majestic bearing to catch our eye, no beauty to draw us to him. He was spurned and avoided by men, a man of suffering, knowing pain, like one from whom you turn your face, spurned, and we held him in no esteem” (Isaiah 52:13-14; 53:2-3). Where is the beauty of the Cross? It is in the holiness of Jesus, who died that the Kingdom of God – life, love, mercy, wisdom – might be established in the world. We are called to “take up the cross,” which means uniting ourselves with Christ in love that the truth and wisdom and the glory of God might shine forth. Today, therefore, St. Paul writes, “I have been crucified with Christ; yet I live, no longer I, but Christ lives in me; insofar as I now live in the flesh, I live by faith in the Son of God who has loved me and given himself up for me” (Galatians 2:19-20). Today we sing, We bow to your Cross, O Lord, and we glorify your holy resurrection!!! 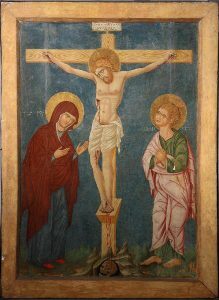 Image: Crucifixion scene from the post Byzantine era of the mid-15th century, at the church museum of Rossáno, Calabria. 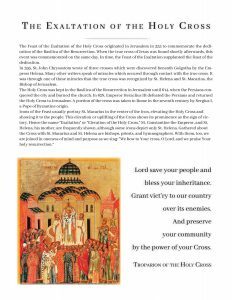 This passage is from the first reading at Vespers on the great feast of the Exaltation of the Cross, celebrated this Thursday (NC). What does this passage have to do with the feast? The “tree” that Moses throws into bitter water, and that makes the water sweet, is traditionally seen as an image of the “life-giving” Cross. Water itself, essential for our biological life, is an image of life. But our life, in merely biological terms, devoid of Christ and His cross-carrying journey, can be bitter. The small and great pains through which we inevitably journey, as we transition from one life-situation to another, can be pure bitterness for us, outside of the Cross. Because from a Christ-less, Cross-less perspective, they are meaningless. And meaninglessness, as Carl Jung noted, is one of the biggest traumas of the modern-day psyche: Today we tend to fear, said Jung, that our lives are meaningless. But in light of the com-passionate, co-suffering with us of the God-Man, Who walked through all our suffering and darkness, even unto death on a cross and descent into our hell, we are given new meaning and new purpose in our New Companion, our primary cross-carrier and Lord Jesus Christ, Who brings us new life through His death. Admittedly, He doesn’t explain to us the “meaning” of all our suffering. Instead He, Who is the eternal Logos, Meaning itself, takes on, in our shoes, all our darkness and suffering, by walking through it in His humanity, and then overcomes it in His divinity, trampling death “by death.” In communion with Him, we go forward His way, of walking through things, according to our responsibilities, rather than avoiding them. And then He does the rest, by His grace, overcoming in us our merely-human anxieties and discouragement, into which we easily slip when on our own, in self-reliance, trying to carry all the ups and downs of the world on our own shoulders. In Him, I discover the “ease” and “light” of His Way, if I just try it; if I try His “how,” rather than ask my “why,” and connect with Him today. “Come to me, all who labor and are heavy laden,” He says to me today, “and I will give you rest. Take my yoke upon you, and learn from me; for I am meek and humble in heart, and you will find rest for your souls. For my yoke is easy, and my burden is light.” (Mt 11: 28-30) So let me try Him today, and find rest for my soul. 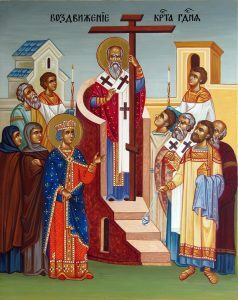 On Thursday, September 14th, we will celebrate the great feast of The Universal Exaltation of the Precious and Life-Giving Cross (known, simply as the Exaltation of the Holy Cross). By the Cross of Jesus Christ we are saved! It is also a day of abstinence. We may not eat meat. (See Statutes, c. 476 2:4). 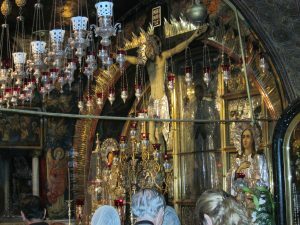 The Divine Liturgy will be offered at 9:00 a.m. (in Ukrainian) and again at 7:00 p.m. (in English). Please come and pray, and bring a friend.